A bounce board is a great way to practice skateboarding, snowboarding, or wakeboarding without hurting yourself. 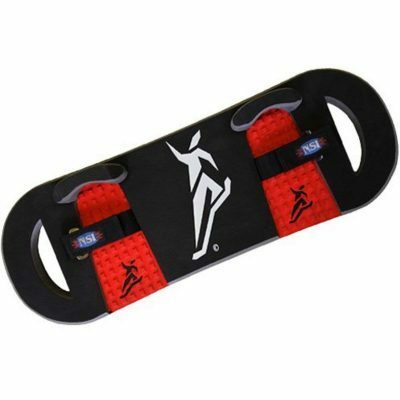 Not only is this a preferred practice item for many extreme sports athletes, it can be a great way to get the most out of your trampoline by adding some fun to the exercise of jumping up and down over and over again. Looking to practice your big air tricks? Want to try out this exciting new trampoline accessory? We’ve searched far and wide to find and review what we consider the 5 best trampoline bounce boards for sale. Maybe one of these will be the one that’s right for you! 2.1 What is a trampoline bounce board? 2.2 Why would I buy a bounce board for trampoline? 2.3 Where can I buy a bounce board? 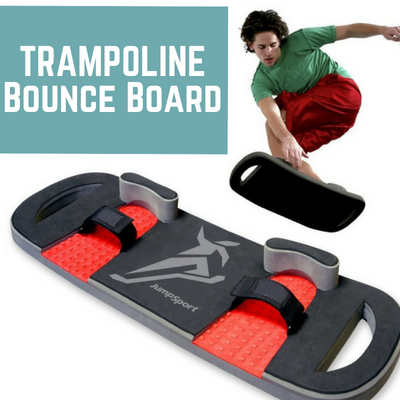 This trampoline board was one of the very first bounce boards for sale and is still easily one of the most popular. For $119 USD you get a core-reinforced eva foam board that’s specifically designed to be used with a trampoline. Double d-ring hook and loop closures that go over the feet will keep the board securely on the feet of anyone aged six and up. This board is incredibly strong and durable – no matter what kind of extreme tricks you want to practice with, you don’t need to worry at all about the possibility of breaking it. Small children and other first-time users may find this board a little too heavy. But for those of us who already know what we want in a bounce board, this is definitely one of the very best options available for sale in 2018. However, the NSI is a lot more lightweight than the previous bounce board on this list, at only four pounds. That makes it a lot easier for beginners to jump with. The NSI trampoline BOUNCEBOARD is also made of a different material than the Extreme Classic – a composite construction known as “closed cell foam.” It’s a little less durable (though it should still be able to put up with anything a beginner throws at it), but the tradeoff is that closed cell foam has much better shock absorption than evo foam. This bounce board also features a no-slip rubber base designed to keep the trampoline safe, although the foot holders are a lot less secure than those of the previous model. JumpSport is a company that makes a lot of great trampolines which you can read about in more detail here. But they also make some excellent accessories for trampolines, including this great trampoline bounce board. It has a much larger size than most (34 inches x 12 inches x 2 inches) and should work for most kids and adults older than 10. A soft and flexible closed cell foam construction with a slip-resistant bottom will keep it from damaging the trampoline or any other surfaces it’s used to jump on. This costs about the same price as the other boards on this list – $120 USD. All in all, a great all-around bounce board backed by a name you know that you can trust. Upper Bounce is another well-known trampoline company, one that usually makes high-end high-bounce trampolines for the discerning trampoline user. However, this bounce board could actually be considered more of a “budget option” – it only costs $68 USD, and has a much less durable construction than the three boards we’ve mentioned before. 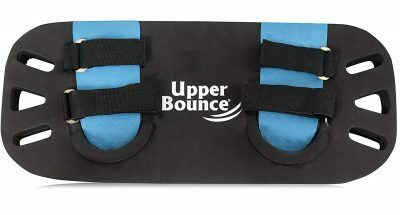 If you want something that will last a long time, the Upper Bounce Trampoline Rebound Board is probably not for you. However, if you’re looking for a cheap alternative to the other boards on this list, this bounce board is still a good lightweight option with rounded edges and great shock absorption that should keep it from damaging your trampoline. And, as a surprisingly advanced option, it actually has the same hook-and-loop velcro enclosure that our #1 board for sale had, so it won’t slip off your feet while you’re practicing for waveboarding or snowboarding. Looking to get into snowboarding? Or, alternately, are you already a snowboarder who wants to take your practice to the next level in a way that’s safe and relatively affordable? The VODA Snow Training Trampoline Board is a bounce board specifically designed for snowboarders who want to improve their skills. It’s designed just like a real snowboard and built out of the same materials, except that it’s made out of a more flexible foam core that won’t damage a trampoline. Instead of hook-and-loop bindings, it uses the same kind of full-foot cinch bindings that a real snowboard might use. 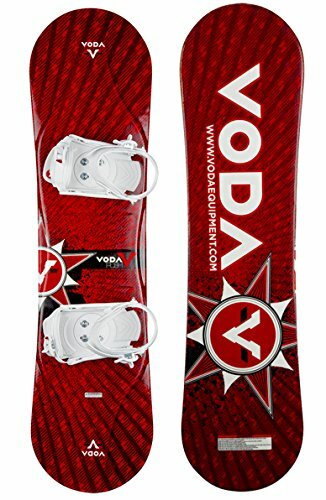 This won’t be the best bounce board for everyone, but if you’re specifically looking for a snow training option, VODA has got you covered! What is a trampoline bounce board? Why would I buy a bounce board for trampoline? 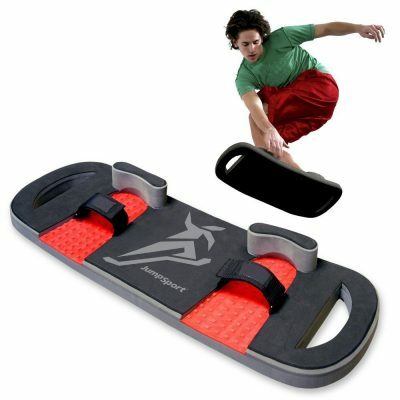 Bounce boards are used by professional extreme athletes to practice certain tricks safely. If you fail to land a big jump properly on a waveboard, you could be putting your life at risk. If you do it on a trampoline, especially an indoor trampoline or one with an enclosure net, you don’t have to worry about seriously injuring yourself in any way. Plus, it’s easier to get that initial bounce. However, trampoline bounce boarding has become something of a sport of its own, with some practitioners developing jumps and tricks that can only be done with a bounce board on a trampoline. Plus, they’re a lot of fun even if you don’t have any interest in making a sport out of it, because they let you do cool trampoline tricks and jumps you can’t do with just your own two feet! Where can I buy a bounce board? The best place to buy bounce boards is on Amazon.com, where you can get cheap or free shipping and the lowest prices around. We have provided affiliate Amazon links in the above reviews, which means that if you purchase using one of those links we get a little bit of money at no extra cost to you the reader. If you like our work, please consider supporting it through our Amazon affiliate links! 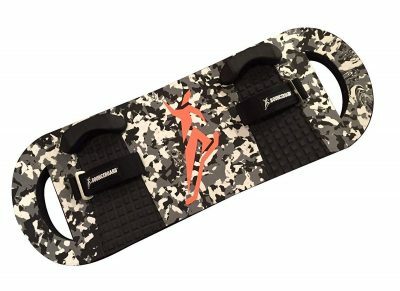 However, bounce boards can also be purchased from the websites of the manufacturers making them (JumpSport, Upper Bounce, etc.) or from certain brick-and-mortar outdoor and sporting goods stores. First, remove your shoes. Climb on the trampoline, and then slip your feet and socks into the loops on the board. Pull the straps tight (where applicable), stand to your feet, and start bouncing! Never use a bounce board on a trampoline that also has someone else on it and never try to jump from the trampoline to the ground – it will most likely hurt a lot and it will definitely damage the bounce board. If you want to learn some more complicated bounce board tricks, check out our other article on the subject by clicking here. We hope that this article has taught you a bit about bounce boards and has helped you pick out a great trampoline bounce board of your very own. Whether you go for something cheap, like the Upper Bounce Rebound Board, or a high-end model like the Extreme Classic, we know that there’s a great bounce board with your name on it somewhere out there.